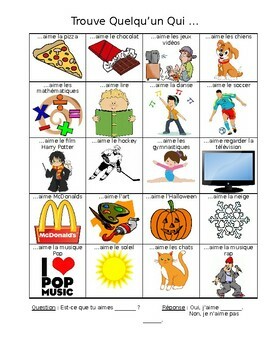 This is a fun and engaging activity that gets students up and speaking en français! Great for any grade! Pictures are included as a support for lower students. - Students must ask each other "Est-ce que tu aimes ______?" and respond with "Oui j'aime ____" or "Non je n'aime pas _____". When a student says Oui, they will write their name over the square that was asked from their partner's page. The goal is to fill each square with a classmate's name.